One of the important aspects of creating a comfortable VR experience is, well… creating a comfortable VR experience. Towards this end I have developed a hygienic interface for a HMD that increases user comfort and hygiene. I originally started this project over a year ago as a way to develop an HMD adapted for use during exercise. 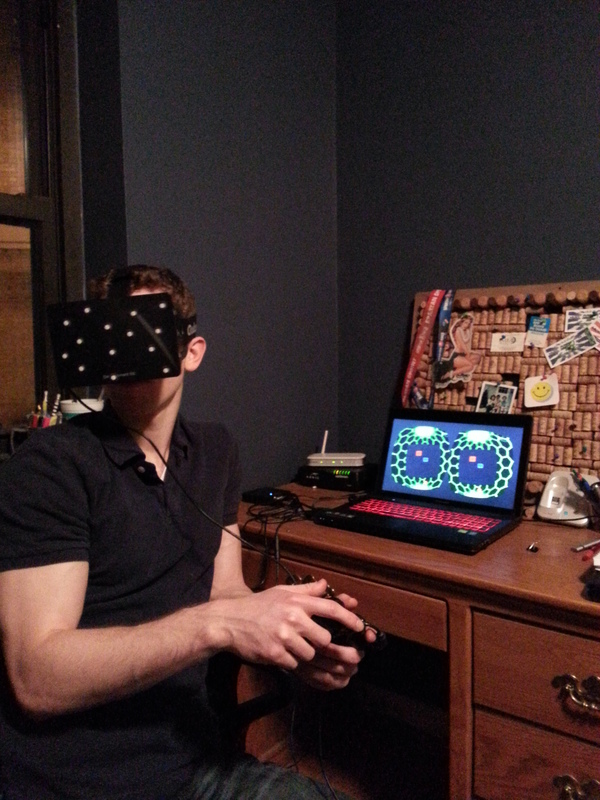 My goal was to create a way to securely fasten the HMD to the face/head of the user as well as deal with user sweat. As I moved forward with the project I realized that it may have broader applicability to HMD’s generally. For example, I plan on using the one-piece foam liner with a removable neoprene insert for future demonstrations of the Rift so that I can clean it between each use. Here are 2 embodiments that I have been playing with: the first utilizes a mask and a liner wherein the mask attaches to the user’s face and the HMD attaches to the mask using magnets. The second is a removable foam liner that fits over the facial contact region of the HMD and stays in place due to friction. 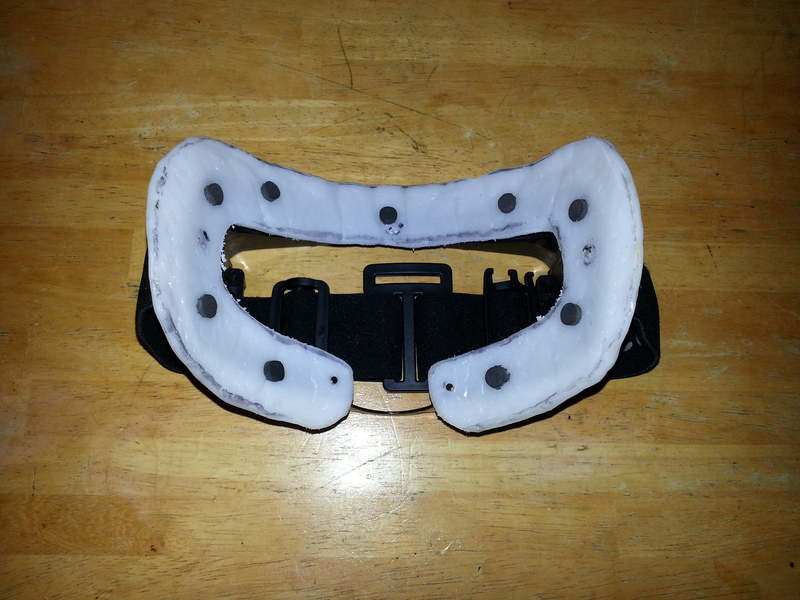 In these experiments I have used the intermediate portion of the Oculus Rift HMD with the foam removed. I am considering running a Kickstarter project to move the project forward. I would appreciate if you would respond to the poll at the end of this post to indicate your interest. Any additional feedback is also welcome. Thanks! The neoprene liner fits on the inside surface of the mask and attaches by means of foam posts that fit snugly into holes on the neoprene liner. 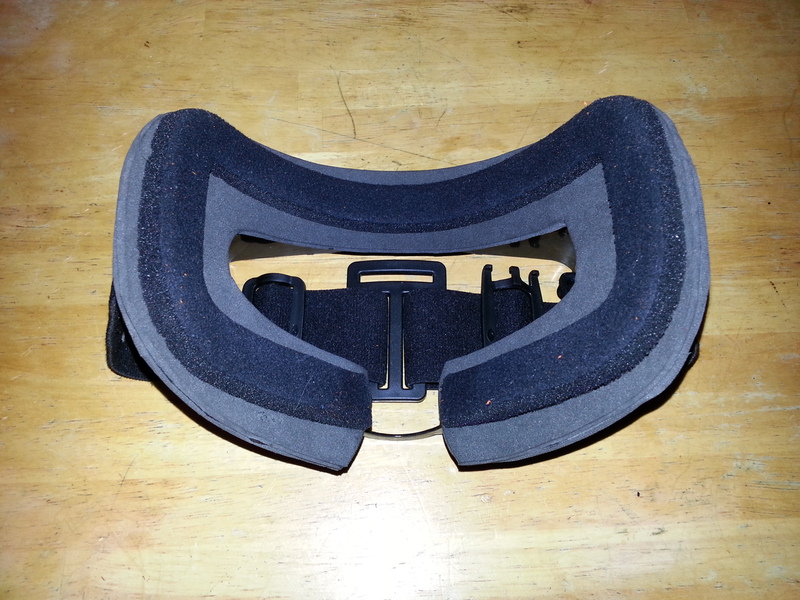 This is the intermediate portion of the Oculus Rift HMD with the foam removed. Magnets are installed on its surface and correspond to magnets installed on the mask to secure the mask to to the HMD. 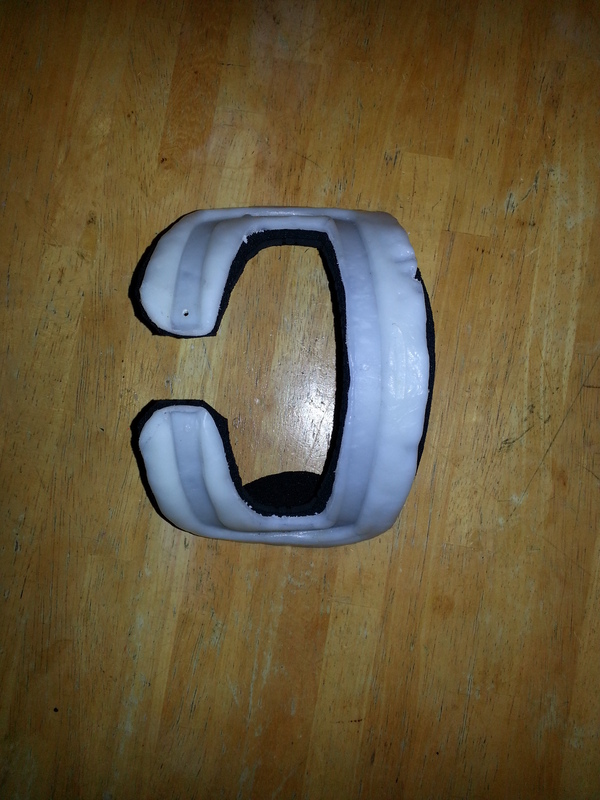 Shown above is the mask attached to the intermediate portion of the HMD using magnets to hold the mask in place. 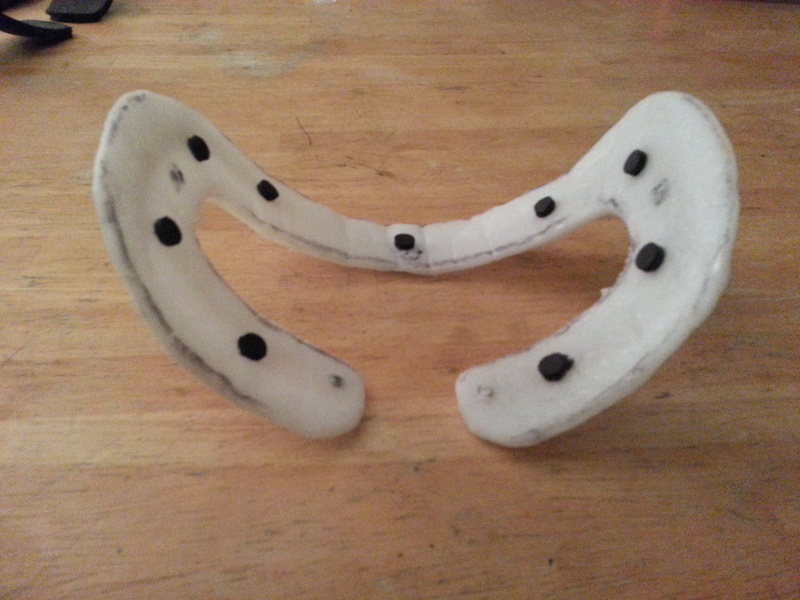 A groove on the mask corresponds to the inside surface of the intermediate portion of the Rift and allows for an exact fit. 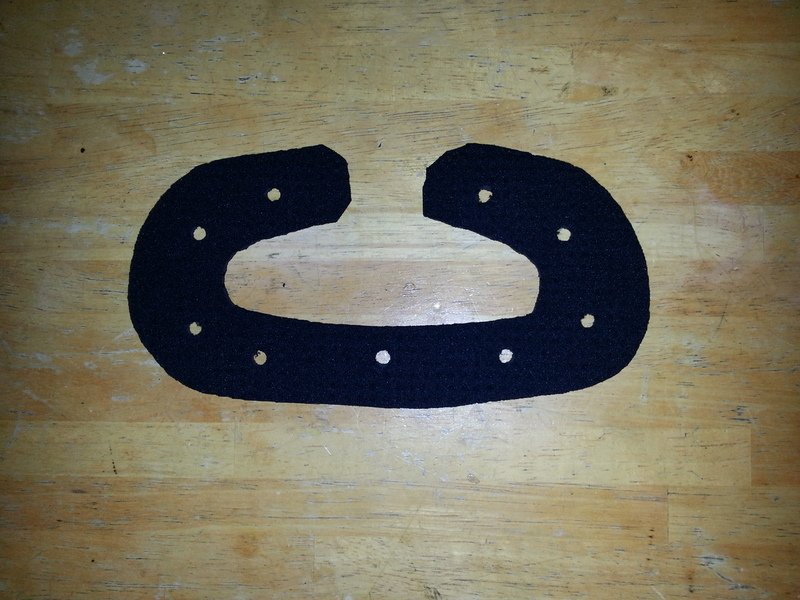 Shown above is the mask with the neoprene liner attached. 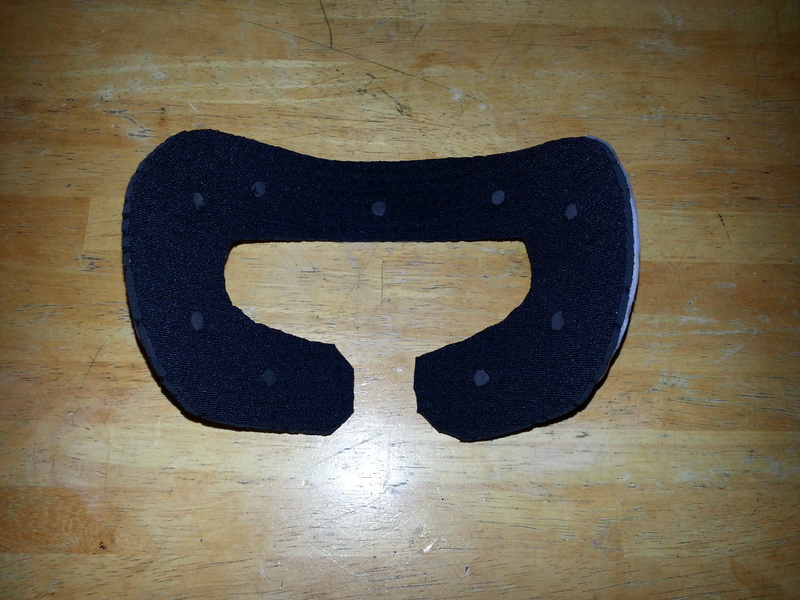 Front view of the mask showing the groove that corresponds to the shape of the surface of the intermediate portion of the Oculus Rift. The groove allows for exact alignment of the mask with the HMD and eliminates the creation of excess distance between the lenses of the HMD and the user’s eyes. 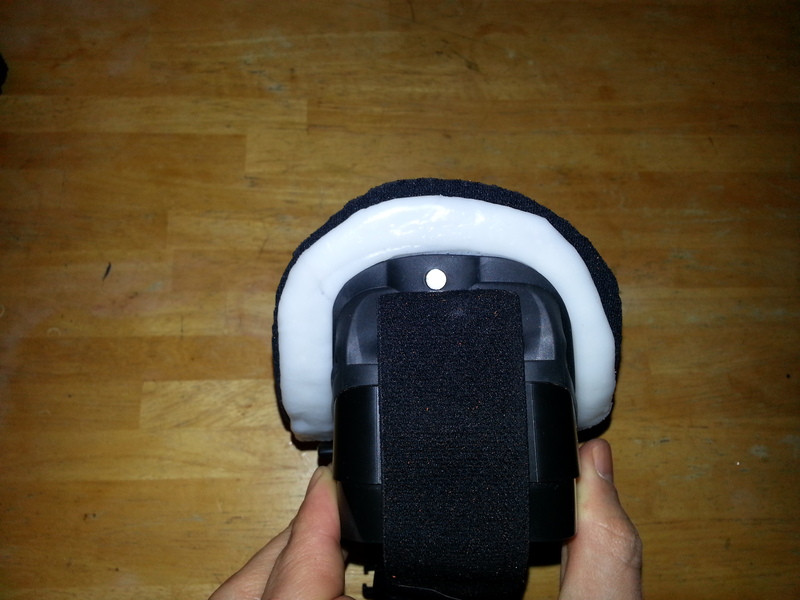 Side view of the HMD with the mask and liner attached. The magnet on the intermediate portion of the HMD is visible. 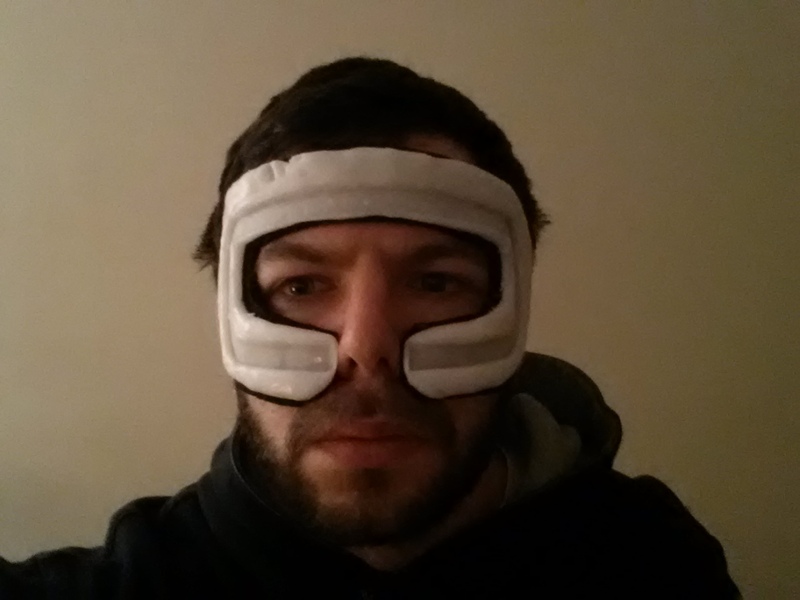 HMD mask attached to the face of a user using elastic straps. 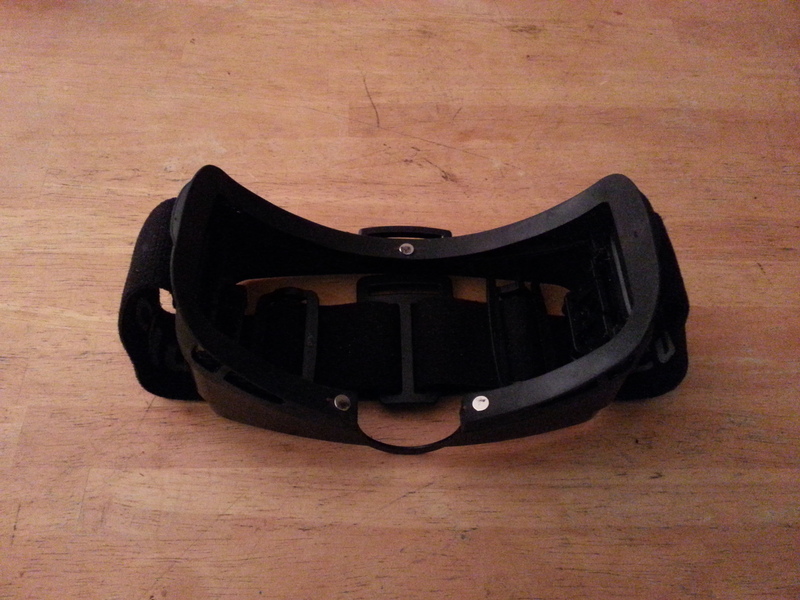 Intermediate portion of the Oculus Rift coupled to the mask, secured in place with magnets. 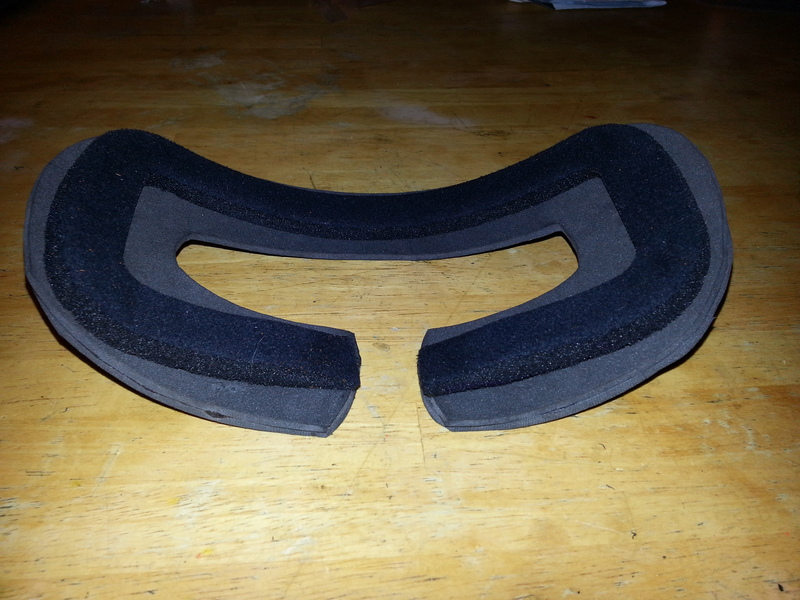 This is the one piece foam liner that fits over the inside edge of the intermediate portion of the Oculus Rift HMD. The snug fit allows the liner to stay in place by friction. Alternatively magnets or other fixative may be used to secure the liner to the HMD. 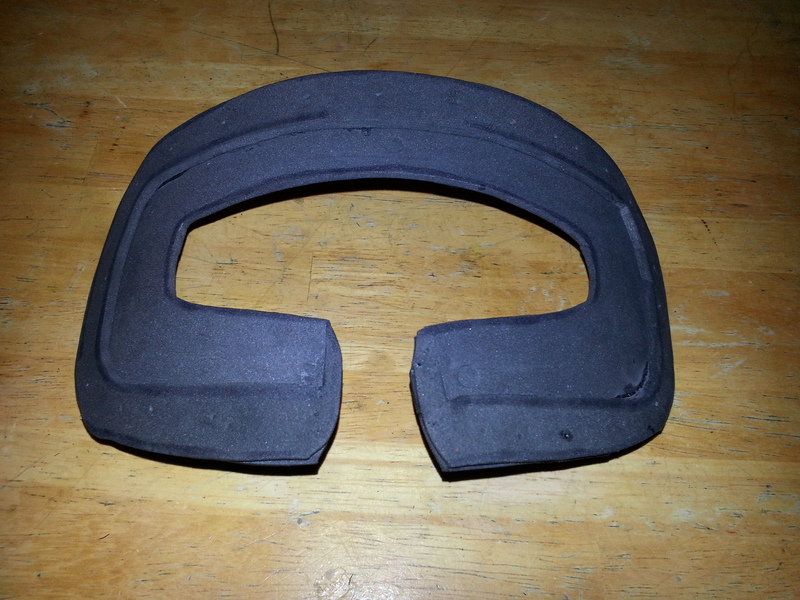 This is the inside surface of the HMD liner shown with one layer of the original Oculus Rift foam attached. Alternatively additional layers of neoprene or other material may be used. For example, a closed cell foam may be preferable as it can be wiped down with alcohol for increased hygiene. The additional foam layers may be removably attachable by magnets, velcro or other fixative. Side view of the liner fitting snugly over the intermediate portion of the Oculus Rift. 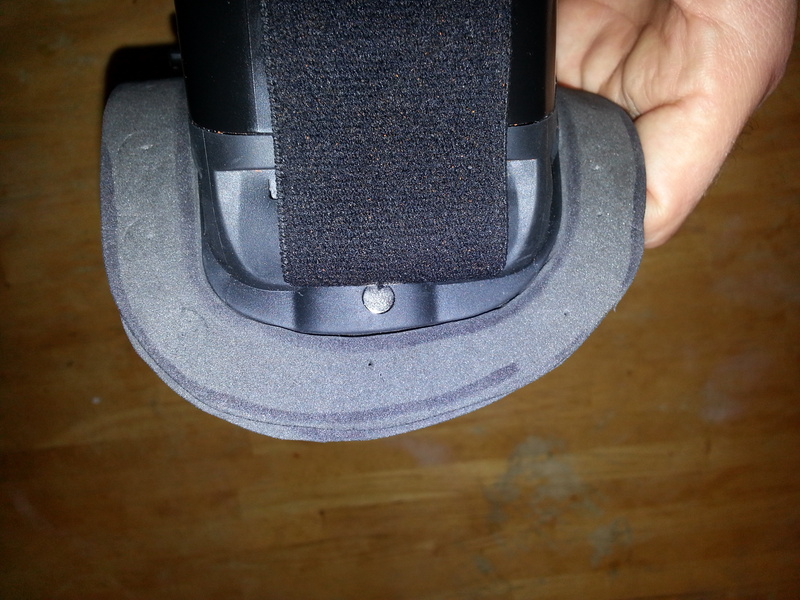 Foam liner shown mounted onto the intermediate portion of the Oculus Rift. 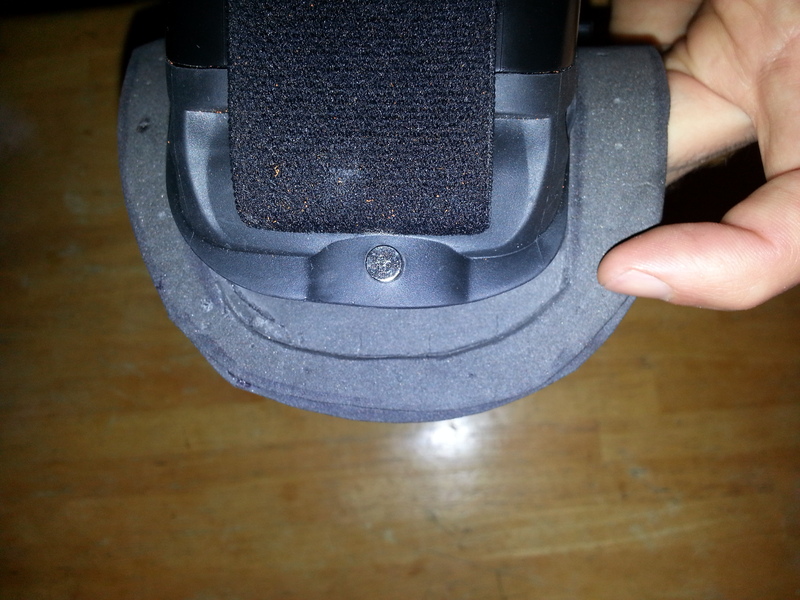 The Rift with the liner attached, mounts to the user’s head using the included straps. Rigorous testing of the the mask and liner shows no interference with the operation of the Oculus Rift. 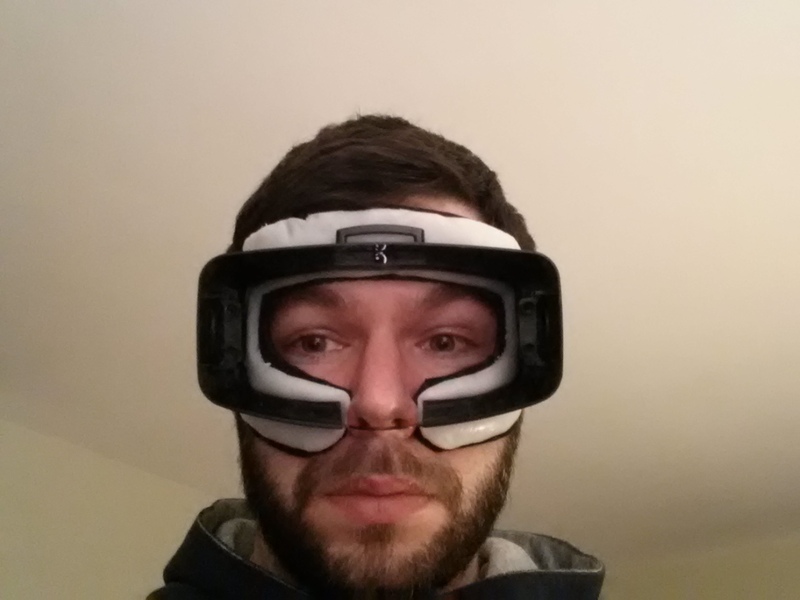 In my opinion the liner and mask make for increased comfort as the Rift is more securely fixed to the user’s face. Future directions include experimenting with other materials such as Kydex and various foams. I’m very excited to keep working on this project as I believe a comfortable and clean user contacting portion of the HMD is going to be critical for mainstream adoption of VR technology. This post is by Eric A. Greenbaum and represents his original development efforts. Pingback: Trying out Zombies on the Holodeck for the Oculus Rift | unofficial Oculus Rift VR Videos | all cool VR Videos in one place!